Take two of the most delicious flavours I know and mix them! The result? – A tantalising amalgam of dark, sinful chocolate and serene raspberry. The inspiration for this seductive mix of raspberry and dark chocolate actually comes from Estonia. In 2017, this small but digitally savvy Baltic state held the rotating EU Presidency, and came up with a special “Estonian EU Presidency” chocolate bar to celebrate this. Raspberries and Chocolate – how to do it! 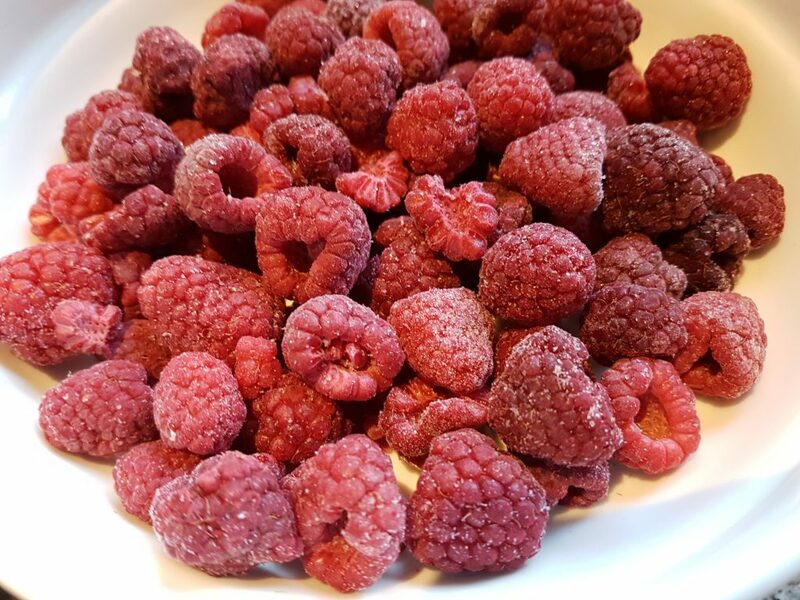 Frozen raspberries – great for ice cream-making! 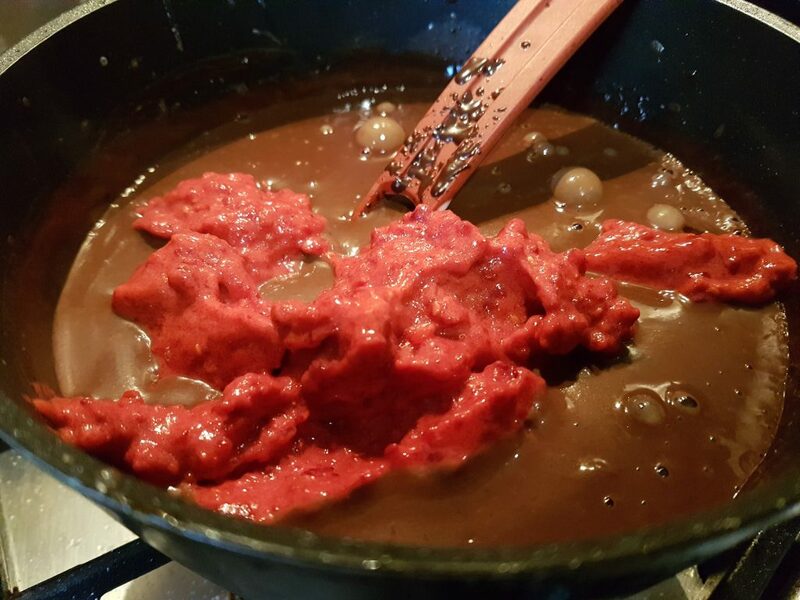 It is quite easy to make this recipe – get hold of some good quality chocolate and cocoa, and a bunch of raspberries (fresh or frozen). We will then proceed by making a simplified custard base (only one egg included! ), add the chocolate and finish by adding the puréed raspberries. This is easy, particularly if you have a hand-held mixer or something like that. Remember to add some of the sugar (and the inverted sugar) to the berries and set them aside for now: this maceration will enhance their natural sweetness and taste. Raspberries -puréed and with some sugar added for maceration while we make the ice cream base. Chop the chocolate (go for some dark, of good quality) in smaller pieces and set aside for now. Then cook the custard. 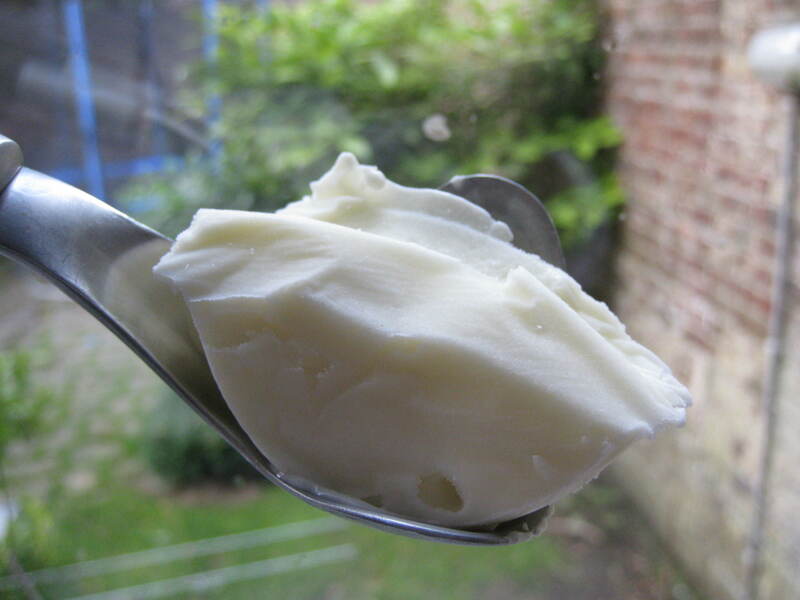 Simplified custard is made in the same way as any custard ice cream base – by cooking it until it has reached the so-called nappe stage when the consistency has thickened as it should and when the included egg should be safely pasteurised. The difference from a “normal” custard is simply that we will use only a single egg (which will add a little to the consistency but primarily contribute to the overall flavour by a “touch of custard”). Start by whisking together an egg, the dairy, the vanilla extract, the pinch of salt and the remaining sugar in a sauce pan. Turn on the heat, continue to whisk the base and carefully bring it to a temperature of about 82-84º C /189-183ºF (or rely on the Spoon-test as described here, in the section about making custard). Even if we’re only using a single egg here, we still don’t want it scrambled. When your simplified custard has reached the required temperature, take if off from the heat, add the chopped-up chocolate and let cool down a little. Then add the raspberry purée. Its all coming together – the chocolate base welcomes the puréed raspberries to the mix! 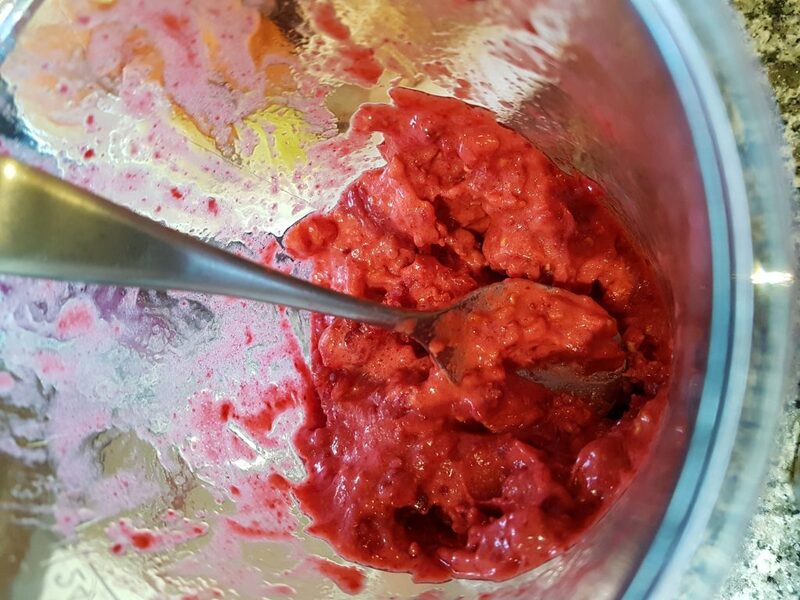 When the raspberry puree has been added, the temperature is bound to fall; once the ice cream base is cool enough, put it in the fridge to chill for a couple of hours or more before you churn it in your ice cream machine. 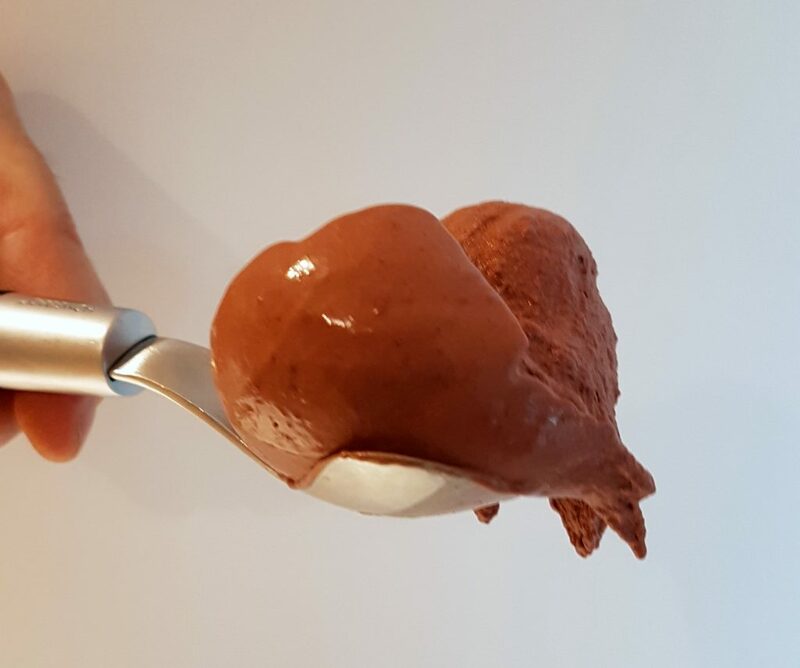 If you have no ice cream machine, still-freeze the base in your normal household freezer, using the method described in this helpful post! 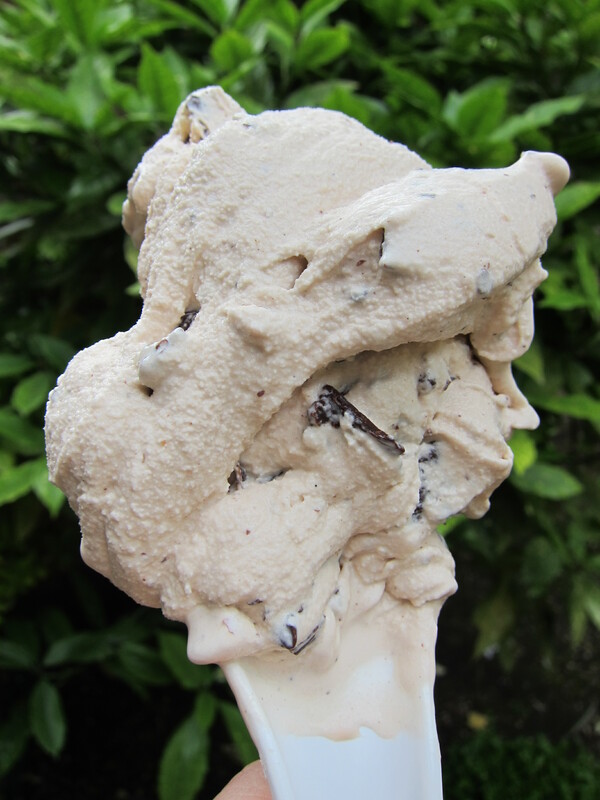 As with many ice creams, this Raspberry Chocolate is heavenly to savour freshly churned. However, if you manage to restrain yourself and save it for later, it stores quite well in the freezer too. 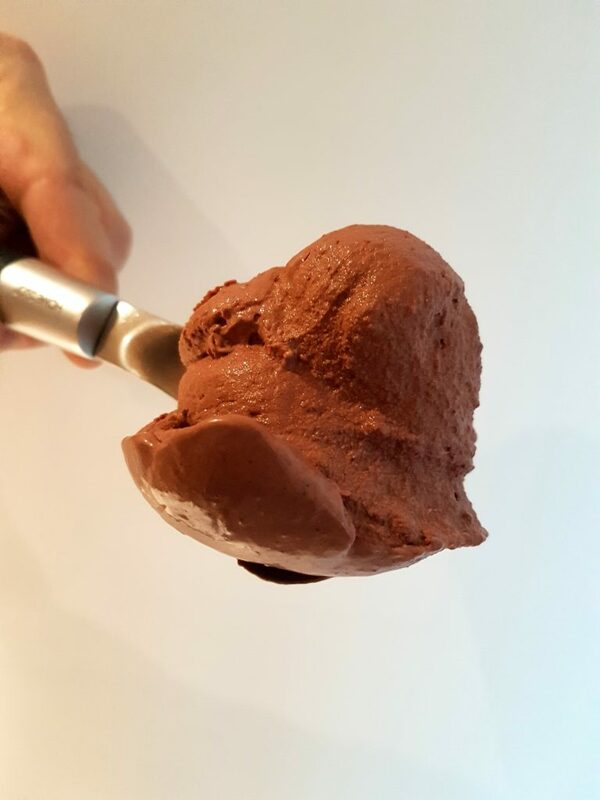 Raspberry and chocolate is a very nice combination, and chocolate lovers should definitely try it – while the ice cream should be generally pleasing, the chocolate clearly remains the defining main flavour. That said, the berries do provide for a delicious added raspberry dimension and won’t go unnoticed. With added notes of vanilla and the subtle custard-touch provided by the egg, this ice cream is not only tasty but also rich, both in flavour and consistency – Just what I like! What about you? Mix the raspberries with 20 gram of sugar and the inverted sugar (here, the Agave syrup). Purée the mix (using a hand blender or similar) and set aside for now. Put the cream, the milk, the egg, the cocoa, the rest of the sugar, the vanilla extract and the salt together in a saucepan. Carefully bring the mixture to a temperature of between 82-84º C /189-183ºF, while whisking and making sure that the base does not boil. Meanwhile, chop the chocolate roughly. 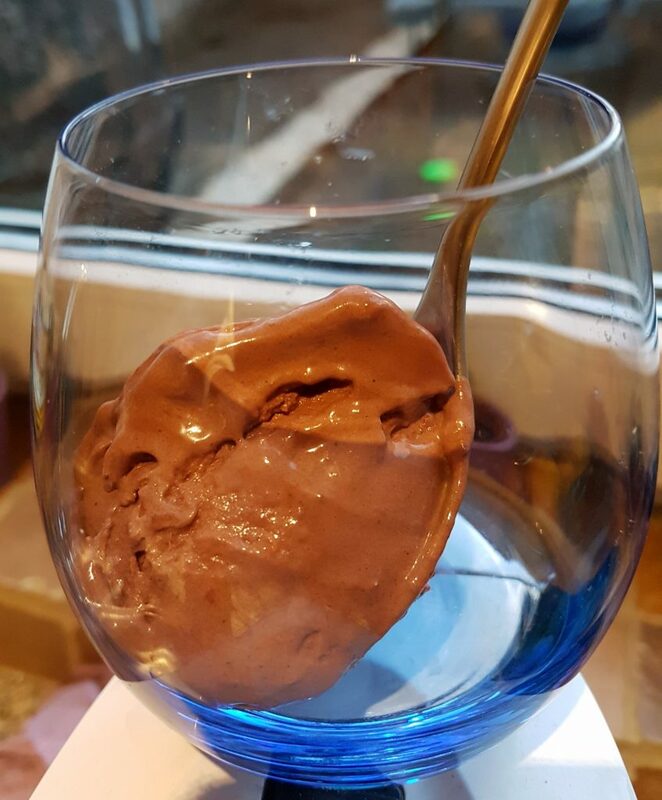 Once the ice cream base has reached its desired temperature (see above), add the chocolate and stir until it has melted. Take off from the heat, let cool down some and then add the raspberry purée. Mix well. Once the ice cream base has cooled down some more, chill it thoroughly in the fridge for some hours, and preferably over night. 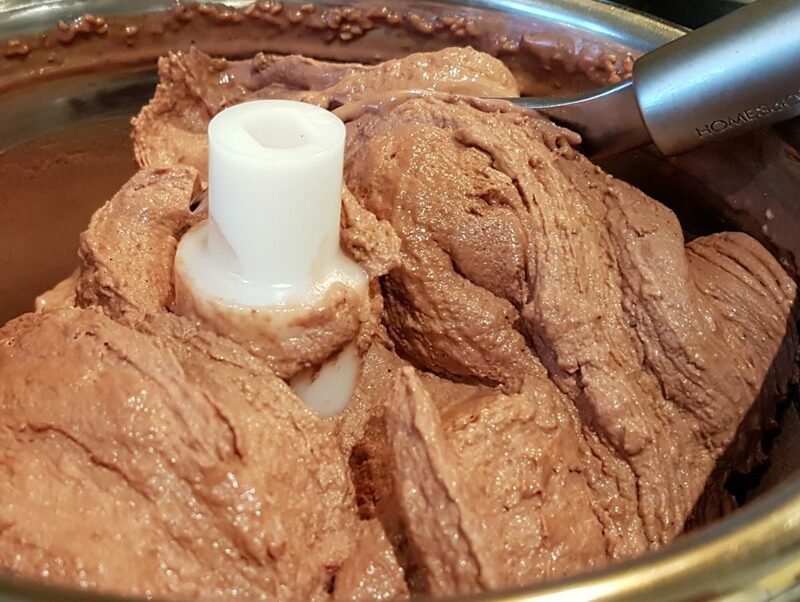 Churn the properly chilled ice cream base in your ice cream machine according to instructions. No ice cream machine? 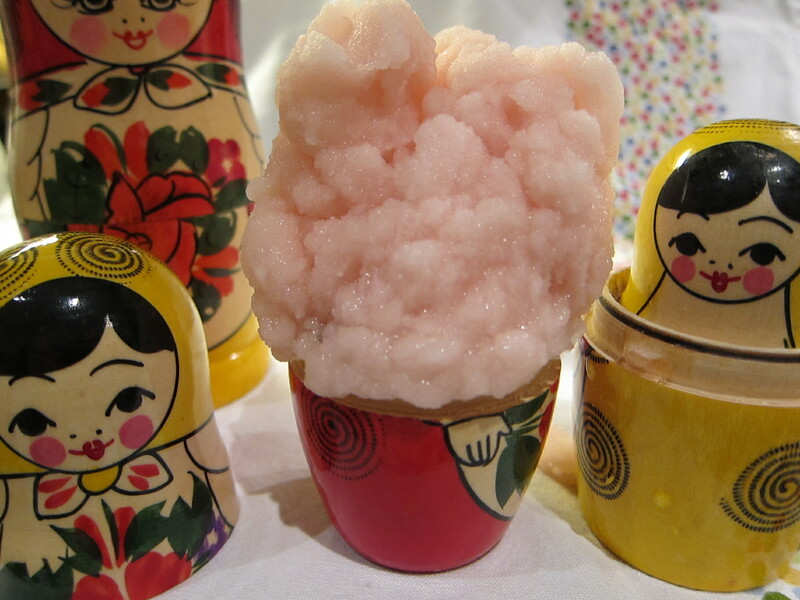 - Still-freeze the base in your freezer!